Full dub got leaked and put online. I can only assume somebody got their DVD early. You got me all excited! I thought when you said "full dub" that you meant episodes 1-25 and I was about to cancel all my plans for the day. 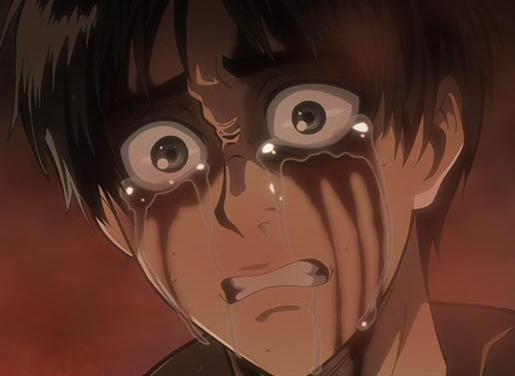 I want to hear the scene where eren gets that piece of rubble through his chest. and he screams like a maniac. I really want to see this part! A7X Rogue Titan wrote: You got me all excited! I thought when you said "full dub" that you meant episodes 1-25 and I was about to cancel all my plans for the day. Well so did I, until I realized that there were gong to be 2 DVDs. A7X Rogue Titan wrote: It's too high pitched for Eren's Titan. I like how it sounds for the regular Titans but Eren's should sound more primal and beastly imo. Like I said, it's not awful but I definitely like the japanese version's roar more. yeah I've seen that the official attack on titan English dub part 2 is coming 9/26. But that's so far awaaaaaay!